THEN: For the four-plus months of the 1909 Alaska-Yukon-Pacific Exposition, the center of commerce and pedestrian energy on University Way moved two blocks south from University Station on Northeast 42nd Street to here, Northeast 40th Street, at left. NOW: The College Inn, on the far left, opened in time for the 1909 A-Y-P and so this year celebrates its own centennial. 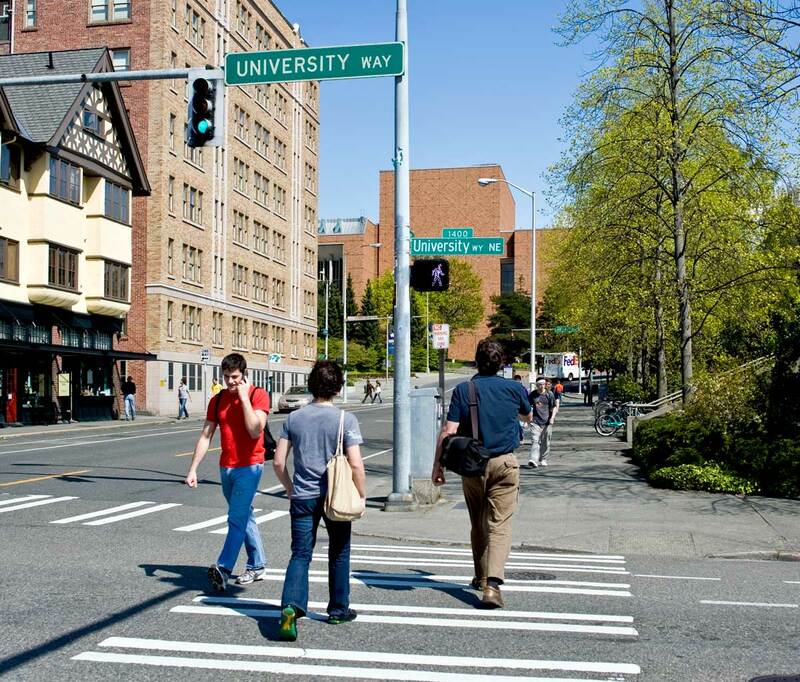 To make our historical photo, Frank Harwood took a position on Northeast 40th Street and looked across 14th Avenue (University Way) to the grand entrance of the Alaska-Yukon-Pacific Exhibition (A-Y-P), on the University of Washington campus. 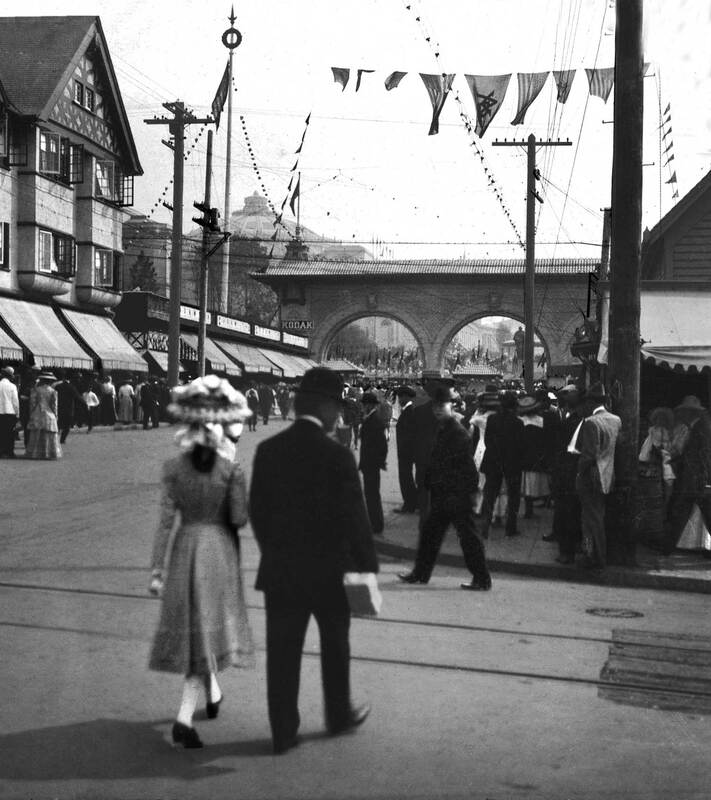 The photograph was taken sometime during the world’s fair’s long run from June 1 to Oct. 16, 1909. Since the newspapers and other sources were filled with descriptions of every event, exhibit and feature of the fair, it can be wonderfully replayed in this, its centennial year. And that is what historian-authors Paula Becker and Alan Stein have done, with a lot of help from the historylink.org staff, in producing The “Alaska-Yukon-Pacific Exposition: Washington’s First World’s Fair,” a book packed with photographs and engaging trivia of all sorts: anecdotes, ironies, pithy quotes, sensational and joyful turns, and tragic ones, too. The authors visit the expo day-after-day like “kids at a fair” — bright kids. This, you may know, is the “launch week” for the city’s centennial celebrations. The book, which is a most impressive expression of our community’s interest in that elaborate spectacular of 100 years ago, is now available in stores. As indicated a few days past, we intend to plant a few Alaska Yukon and Pacific stories in this site through the coming weeks. We know of more than thirty direct AYP features, or related stories, that I have written for Pacific Northwest Magazine over that past 27 years and we intend to include them all. We will also pull a few more AYP strings attached to parts of our collections, including some of Ron Edge’s clippings from local 1909 newspapers. Through the years I have made copies of photographs in many odd collections and it will be a pleasure reviewing and sharing many of them. We start with this most recent feature – the one that appears in Pacific on May 24, 2009. Appropriately, this views looks from outside AYP towards the main gate and so beyond it to what we will be visiting in the weeks ahead. The story to follow that look-in will be the feature on the AYP’s official “lookers,” the fair’s photographers: the one’s allowed to use professional gear and to market the results with a percentage going to the Expo’s management. There were, of course, also scores of unofficial photographers for by 1909 cameras were almost commonplace. Many of these also managed to sell some of their unofficial impressions. Finally we will repeat the story that first appeared in Pacific on March, 26, 2006 of Dan Kerlee, our representative master collector of AYP stuff and student of what it all meant. We show Dan standing with an AYP pennant near where Otto Frasch, the unofficial but prolific postcard photographer, stood to take his exhilarating recording of a crowd outside the Expos’ loudest gesture to military history, the Battle of Gettysburg. You had to pay extra to see it. We refer you there to Dan’s webpage on the AYP, which he has forthrightly named AYPE.COM. Again, there will be much more to come through the spring and summer – for as long as the AYP lasts, only a century later.